Strawberry season is finally here! It has been for a month or so, but I feel like we're just beginning to see the real benefits in our grocery store. I didn't get a chance to go berry picking this year at a local farm - something Liam and I did last year and had a blast at - mostly because I couldn't think of anything more challenging than picking berries and corralling a 3-year-old while in the 3rd trimester of carrying twins. However, that hasn't stopped me from stocking up at the grocery store and getting to the best part - eating and creating with them! As any strawberry lover knows, there are about a million ways to serve these juicy red beauties. Literally, the amount of recipes knows no bounds. 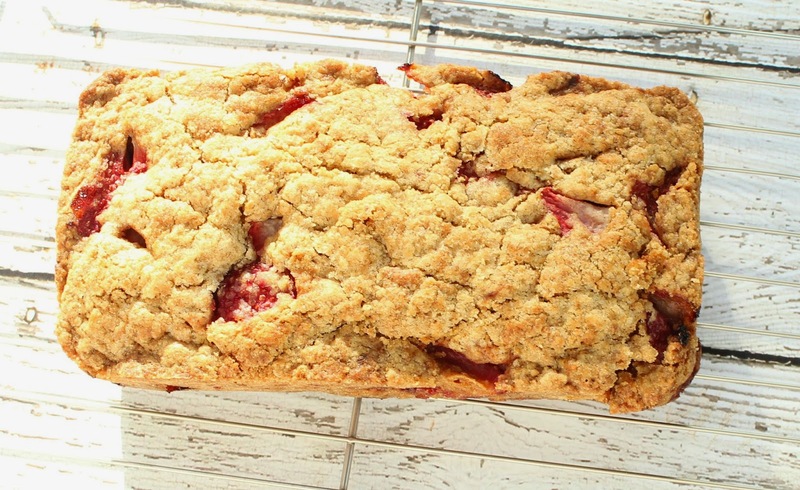 I would like to humbly submit one tried-and-true recipe, though, that has been around in my family for as long as I can remember: The super-simple, super-delicious Strawberry Bread. Here's what I love about it: It takes barely any time to make, comes together easily, and is absolutely foolproof. It's a winner every single time. Mix dry ingredients. Add egg and oil. Mix and fold in berries. Bake in a lightly greased bread pan for 50 to 60 minutes at 350˚. Let rest in the pan for about 10 minutes, but no longer than 20. Invert onto a cooling rack, and let cool completely before slicing. Yields: 1 loaf. I swear, it's that easy! A couple of notes: The "dough" is more like a batter, but it's not really pourable. You kind of need to form it into the bread loaf pan, and I find that a non-stick spoon or spatula gets the job done. This "bread" is more like a dessert bread, really and it rises, but not too high. I'm serious about the no slicing until it's cool: It will absolutely crack and break apart if you try to handle it too much before it cools. 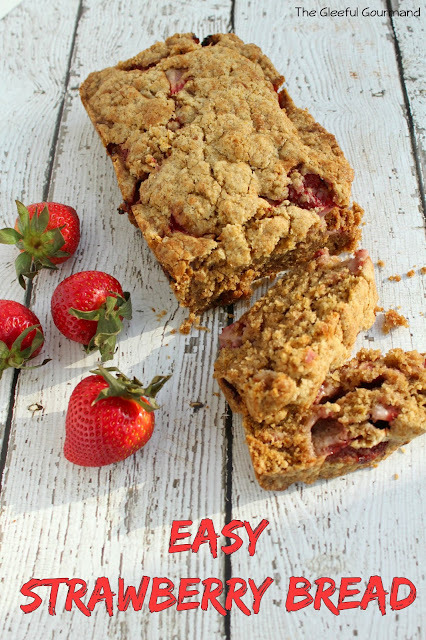 This Strawberry Bread is perfect for breakfast, or for dessert, but I especially love serving it alongside a nice crisp summer salad. Makes an excellent gift for anyone in your life who loves strawberries, but it's okay to be selfish and keep it all to yourself, too. I was all set to try out your bread (which looks absolutely tasty!!) when a Twitter friend turned me on to a Strawberry Cake recipe. And since I'm more of a cake-girl than a bread-girl (because of my horrible sweet tooth), I figured that I'd give it a go. I can't say I blame you - my favorite cake is the strawberry cake my mom makes! But I promise you, this bread will satisfy your sweet tooth. It's almost more like a dessert than an ordinary bread. But I seriously wouldn't waste your money. My baking has certainly never suffered from never using one, and I don't really see the point. 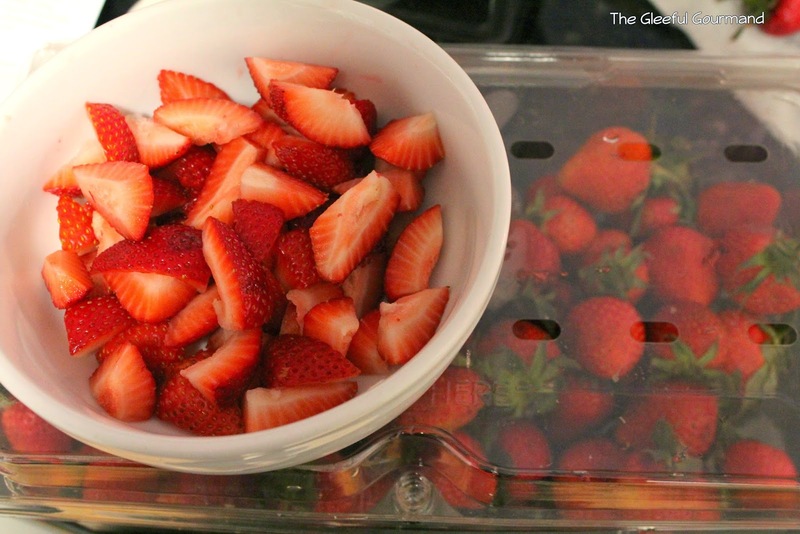 Use a good paring knife and cut off the top of the strawberry. I kind of do it so the less of the strawberry I get the better, making a sort of V in the top when it's done.